We offer hourly programming and consulting services. Reduce your project risk by engaging Certified LabVIEW Developer. Extend your project team by involving LabVIEW specialist. Get expert resource to give your project a head start. Engage and release as your project requirement changes. We deliver code which is modular, scalable & maintainable. We design, development and support purpose built turn-key system solutions. We deliver complete solution including sensors, electrical panel, wiring, design, development, commissioning and support. We closely work with our clients to understand the requirements through out the project life cycle to deliver innovative solutions. We integrate your LabVIEW based application to existing / new hardware, database or communication infrastructure. We assist form small integration projects to complete turnkey solutions. We have worked with all size of companies. One of our key strength is ability to deliver end-to-end solutions - from concept to commissioning. 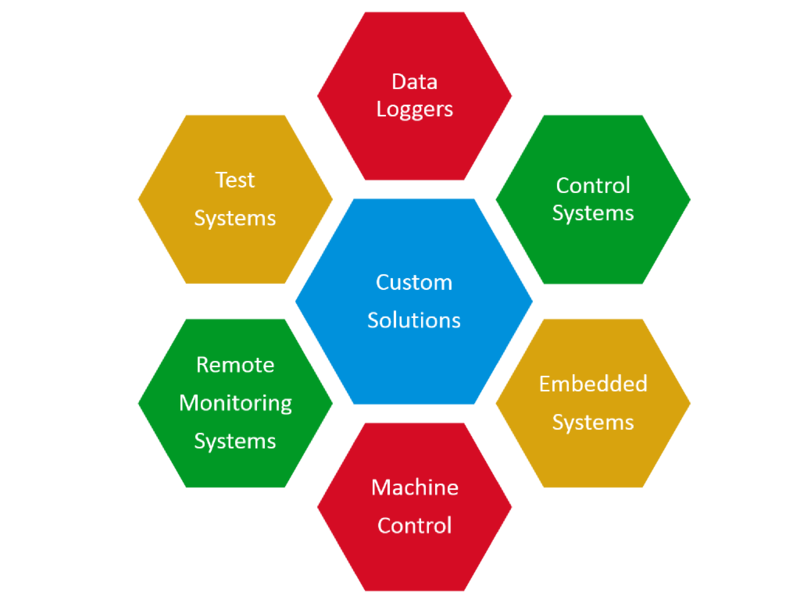 We have solution for every data logging application. Our data logging solutions are scalable & flexible - which can log data from very slow rate (a sample every few minutes / hours) to very high speeds ( mega samples per second). We can log data to different file formats such as csv, excel, tdms etc. or we can also interface to different database like SQL, Oracle, Access etc. All our data logging solutions have very user friendly GUI interface. We use NI's CompactRIO platform to develop advanced control and monitoring applications. It's best off-the-shelf platform to solve any demanding control and monitoring applications. We leverage on NI's RIO technology to develop innovative embedded systems without wasting development time and cost on custom designs. PXI is the an open PC-based platform for automated test. We use NI PXI platform for automated test applications to achieve high stability, accuracy and speed. It's also preferred platform for high channel count applications. We use LabVIEW, Teststand as primary tool for application software development. Check out following to know more about automated test.